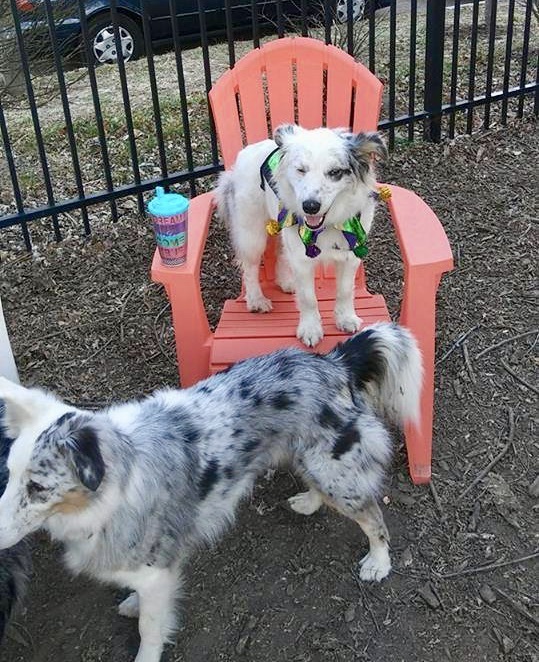 Speak St. Louis is a 501(c)3 foster-based Australian Shepherd rescue specializing in double merle awareness. We are passionate about helping all Aussies and Border Collies, including those born with hearing and vision impairments as a result of merle to merle breeding. WHATS SO SPECIAL ABOUT "DOUBLE MERLE"? The term "double merle" refers to a dog bred by two merle colored parents. 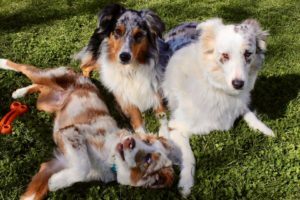 Most of us are unaware, but when two merles (of any breed) are bred together, each puppy has a 25% chance of being born as a double merle. Common breeds with the merle trait include: Australian Shepherd, Border Collie, Catahoula Leopard, Chihuahua. Collie, Dachshund, & Great Dane just to name a few. 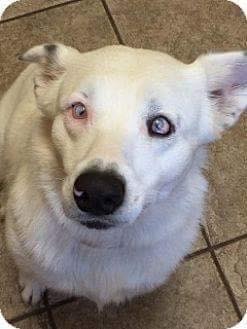 Born with excessive white coloration, these dogs are known to have eye abnormalities, hearing impairments or sometimes even both. Double Merle puppies are often dumped into shelters or left to fend for themselves by careless breeders. As a rescue, here is where our motto comes into play "We See Possibilities, Not Disabilities". Although impaired, these dogs are capable of living perfectly normal lives with the help of those who believe in them. They're intelligent, happy, and do not know life any other way than the way they were born. Just like any other "normal" dog all they need is love, patience & dedication. Merle is a color pattern, not a color by itself. The most common variations are the red & blue merle. The blue merle is genetically a black dog carrying the merle gene. The merle gene breaks up the black color into a pattern of black patches onto grey. The red merle is genetically a red dog carrying the merle gene. The merle gene breaks up the red color into a pattern of red patches onto beige. HOW DOES THIS IMPACT THE EYES & EARS? Often, but not always, double merles will be deaf and/ or also have a visual impairment. Most of the time the eye problems are visible, but sometimes an exam by veterinary ophthalmologist is 'recommended to confirm a diagnosis. 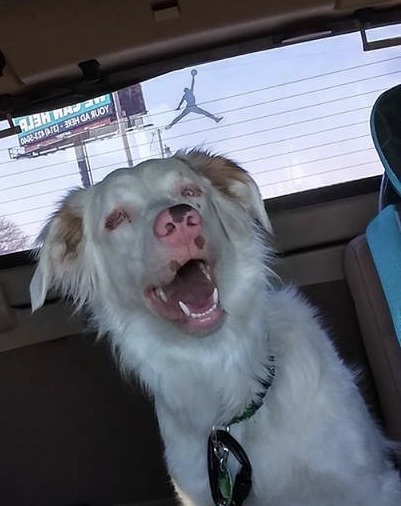 The defects are generally stable, so if a dog has functional vision, that will probably not change as it matures, unless affected by another condition (unrelated to the merle gene). Some dogs will have an irregularly shaped pupil often referred to as "starburst" or , "eccentric". The pupil can also appear not to be centered in the iris which is called "dropped pupil" (pictured left). When the pupil is off just a bit, the dogs seem to cope just fine, but can have trouble when the condition is more pronounced. Microphthalmia, or an abnormally small eye, is the most common eye defect seen in double merles. This can vary from just noticeable to appearing to have no eye at all. Usually, the smaller the eye, the more of the third eyelid that is permanently visible. No. Atthough you may hear otherwise, these are the only known health problems proven to be associated with double merles and their genetics. Stories about "internal organ" problems, allergies, immune system problems, or a shortened life span are all false. The fact of the matter is that many "normal" dogs suffer from the same problems.